This work is from a photographic series that document the artist’s mobile, monumental public sculptural work, each piece positioned publicly to provide commentary on the context of its surroundings. Wheel, 2009 was constructed to function as a Ferris wheel of cookie-cutter condos targeted for sale to the growing middle class, a repetitive amusement ride that reminds us of a history lost in the ceaseless destruction for temporary modernity. 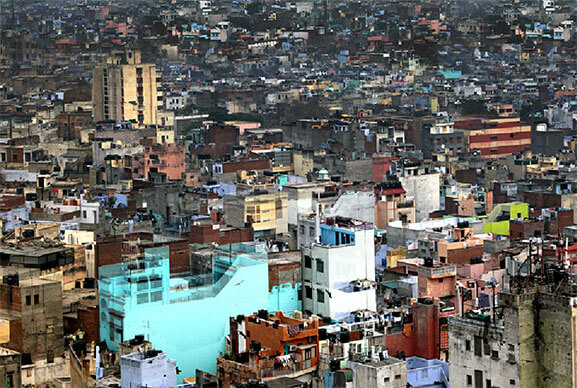 This work, both in its sculptural and photographic form, speaks to Scaria’s preoccupation with the perpetuation of urbanization and what seems to be an uninterrupted cycle of movement and change in his home base of New Delhi. 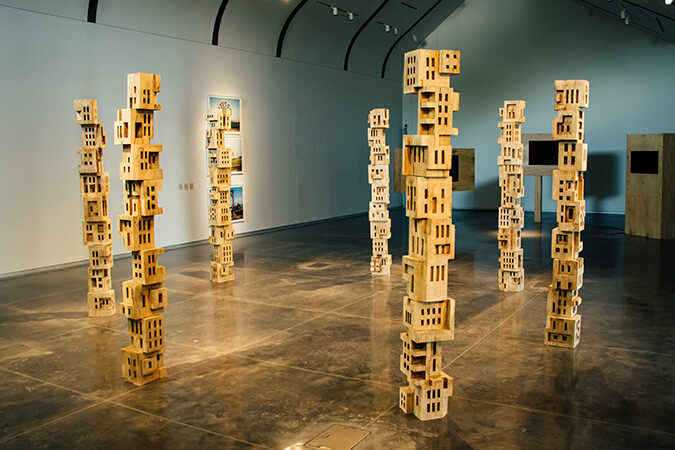 Inspired by a site visit to Cahokia Mounds State Historic Site two years ago, Scaria’s Woodhenge, 2016 refers directly to the speculative theories about the collapse of the Mississippian civilization that was abandoned by the mid-13th century. Scaria surveys various icons of de industrialized landscapes and the comparatively new Indian trend toward suburban sprawl. The work is inspired by the migration shift and community collapse in St. Louis’ own history and current day new Delhi. The physical erasure of the remnants of the pre-historic, archeologically distinct community around Cahokia is comparable to the destruction of areas in New Delhi. Industrial-scale developments are uprooting old communities with a long folk history, destroying the “unaesthetic” architecture associated with it becomes the subject and object in Scaria’s hands. 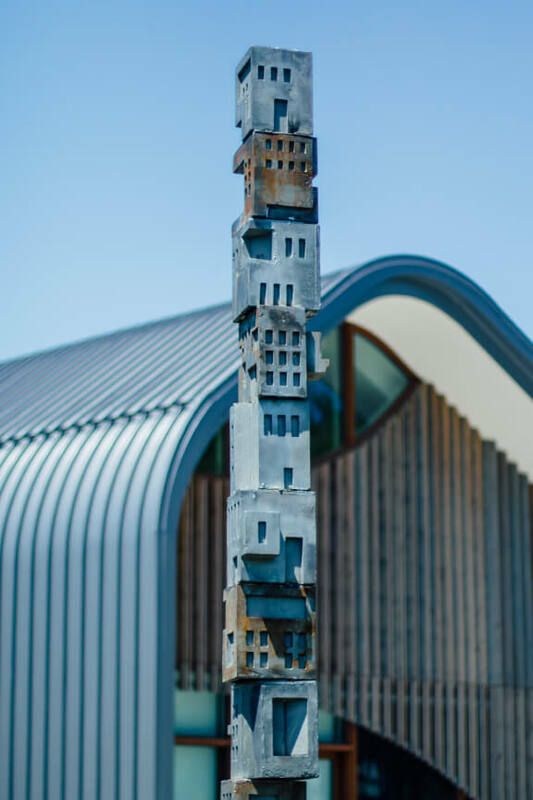 Made up of maquettes of disappearing Delhi domestic spaces, meticulously carved in wood, stacked on top of each other, then cast in steel, Scaria’s version both vertically maps the reckless civic decisions and illustrates the beauty in simplistic urban domestic habitats. 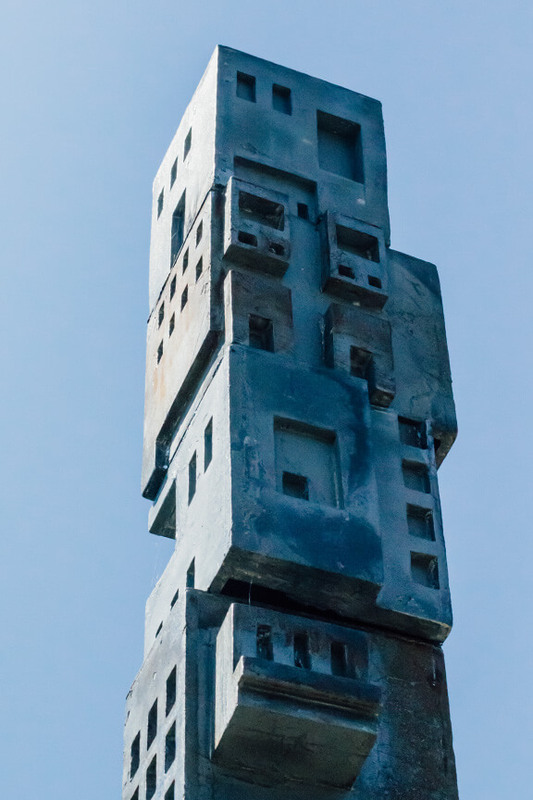 This totemic sculpture stands as a monument to the building of a civilization past and as an illustration of historic and contemporary social and cultural shifts. This work is from a photographic series that document the artist’s mobile, monumental public sculptural work, each piece rolled into place to provide commentary on the context of its surroundings. 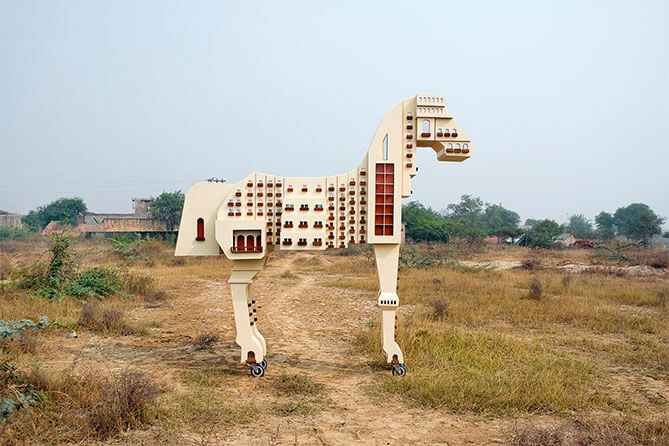 In the sculpture Someone Left a Horse on the Shore, 2007 Scaria presents us with a mobile high rise in the shape of a Trojan horse, positioned in a scrubland in the outskirts of Delhi. Here, the metaphor of the Trojan Horse is inverted, Scaria’s horse is unoccupied and the city upon which it has infiltrated has instead lay beseige to it. Scaria’s video Expanded, 2015 uses the same architectural motif of ubiquitous high rise condominums common in his other work; the film literally scrolls through an overbuilt landscape of temporary housing as it chronologically unfurls archival images of refugee camps from diverse locations and different times in our history. Stitched together in order to make it look like a single landscape, the scroll has both religious and historical connotations. The work deals with migration and what seems like an infinite stretch of the past and future of an unsettled human condition. Expanded also focuses on temporary structures, the design of habitat and the architecture of basic needs. Panic City, 2006 is a comment on the recent construction frenzy in India. An animation constructed from photographic stills, the 360 degree aerial view of old Delhi is shot from the minaret of Jama Masjid (a Mosque built by the Mugal emperor Shah Jahan). The photographs were then stitched together using flash animation to set the city’s architecture in motion. Individual buildings in the cityscape rise and fall to a blend of Pavarotti and Vivaldi. Scaria conducts this photographic symphony of urbanization with a bit of tongue-in-cheek humor as Panic City illustrates the construction and consequential destruction that narrate the ongoing transformation of his home base of New Delhi. Chronicle of the Shores Foretold, 2014 is part of a larger photo series documenting the performance that is the fabrication and installation of a large-scale public work Scaria made for the Kochi Biennale in 2014 signifying the passage of time and experience of religion in the coastal region. In the piece, a 2.5 ton stainless-steel bell stands 13 feet tall at the small dock. It functions as a fountain, with Arabian sea water spilling through its many drilled holes. The sculpture was lifted into place by a group of mappila khalasis, who are traditional dockyard workers. Their act, without their knowledge, was part of an orchestrated performance, an homage to the modern-day khalasis who continue to perform feats of lifting, now considered the domain of machines. Inspired by his site visit to Cahokia Mounds State Historic Site two years ago, Scaria’s Woodhenge, 2016 refers directly to the speculative theories about the collapse of the Mississippian civilization that was abandoned by the mid-13th century. Scaria surveys various icons of de-industrialized landscapes and the comparatively new Indian trend toward suburban sprawl. The work is inspired by the migration shift and community collapse in St. Louis’ own history and current day New Delhi. The physical erasure of the remnants of the pre-historic, archeologically distinct community around Cahokia is comparable to the destruction of areas in New Delhi. Scaria’s Woodhenge mimicks the formal shape of the Woodhenge at Cahokia. The poles are made up of maquettes of disappearing Delhi domestic spaces, meticulously carved in wood and stacked on top of each other. Scaria’s version both vertically maps the reckless civic decisions and illustrates the beauty in simplistic urban domestic habitats. Shadow of the Ancestors, 2015 is set in a vast and deserted landscape focusing on a large decaying log. In time, the tree trunk casts a growing cityscape in its shadow. Eventually the big stump rolls back and forth, catches its shadow of high-rise living and presents its imprint of a living landscape of identical apartment blocks. The work highlights Scaria’s preoccupation with mobility and human displacement at the expense of and disregard for the history and the manner in which it can dissipate landscapes at whim. The work uses the movement that video provides to amplify the gestures of expansion and conquest. Gigi Scaria was born in 1973 in Kothanalloor, Kerala, India. He received his M.F.A. in Painting at Jamia Millia University, New Delhi, in 1998 and his B.F.A. in Painting from the College of Fine Arts, Thiruvananthapuram, in 1995. Scaria’s works have been included in a number of important exhibitions and venues, most notably the Kochi-Muziris Biennale in 2014 and the India Pavilion at the 54th Venice Biennale, the 3rd Singapore Biennale and the Prague Biennale, all in 2011. He has had solo exhibitions at the Smart Museum of Art-The University of Chicago; The Jewish Museum, New York; Ian Potter Museum of Art-The University of Melbourne; Dubai Art Fair, United Arab Emirates; Gallery Chemould, Mumbai; Galerie Christain Hosp, Berlin; Video Space, Budapest; The National Art Studio, Changdong, Seoul; Govett Brewster Art Gallery, New Plymouth, New Zealand; Palette Art Gallery, New Delhi; and the Inter America Space, Trinidad. Scaria has also exhibited at India China Contemporary Art, Shanghai; Museum of Contemporary Art, Taipei; Helsinki City Art Museum; Kulturhuset, Stockholm; National Gallery of Modern Art, Mumbai and at Vadehra Art Gallery, London. Scaria lives and works in New Delhi. 2008 Difficult to Imagine, Easy to construct, Art Asia Miami, USA. 2008 Site under construction, Video Space, Budapest, Hungary. 2008 New Perspective from India, Seoul/Delhi, recent photographs and video, H Cube Gallery, Seoul, Korea. 2007 Absence of an Architect, video installations paintings and photographs, Palette Gallery, New Delhi. 2005 Where are the Amerindians?, Inter America Space CCA7, Trinidad. 2001 Exhibition of recent works, Art Inc., Shahpurjat, New Delhi. This video explores the impact of material and natural surroundings on the mood of the work. The stark relief of its weathered texture against a cloudless blue sky offers a different lense with which to interpret the piece. Different still is the footage of the totem against the tree line as people walk past. Note how the presence of observers change the landscape within the room. Mark the tonal shifts when the work is viewed in a crowd compared to a single visitor. Contrast the textural details you can see up close with what is conveyed from further away. Gigi Scaria, part of India’s next generation of artists active at home and abroad, makes humorous—sometimes scabrous—installations about the broken city. Trained as a painter, Scaria uses a diverse range of visual objects to grapple with the complex history of India, its ancient world flaring at the edges of the contemporary. New Delhi, Scaria’s current residence, epitomizes the conflict between high-tech innovation and a backdrop of giant city impoverishment. Scaria approximates the destabilized social environment of our new global “normal” for cities. With the sculpture, video and photographs in Time, Scaria evokes the dynamic potential of these environments created by local exclusions and intertwining global economic demands. Scaria is part of Laumeier’s outward looking thematic focus New Territories: BRICS, which follows the conclusion of our five-year exploration of Archaeology of Place. New Territories: BRICS honors Laumeier’s historical support of artists from around the globe, while engaging with artists from the global cultural zones that jostle the economic and political alignments that dominated four centuries of American history. This reaffirmed global outlook also nods to the fact that, in 1850, 50% of St. Louis residents were foreign-born; today, that number is 4%. Like many of our region’s institutions, Laumeier wants to break the blockade that has intentionally (or not) diminished the vibrant cross-pollinization that gives global cities their diverse character. Scaria’s work holds within it the seeds of inequity and discontent that these cities represent. Thanks go to Laumeier’s staff, Board and volunteers who have helped redefine Laumeier’s goals for the next five years. Dana Turkovic, Curator of Exhibitions, has worked closely with Scaria on his first solo exhibition and outdoor sculpture in the United States. 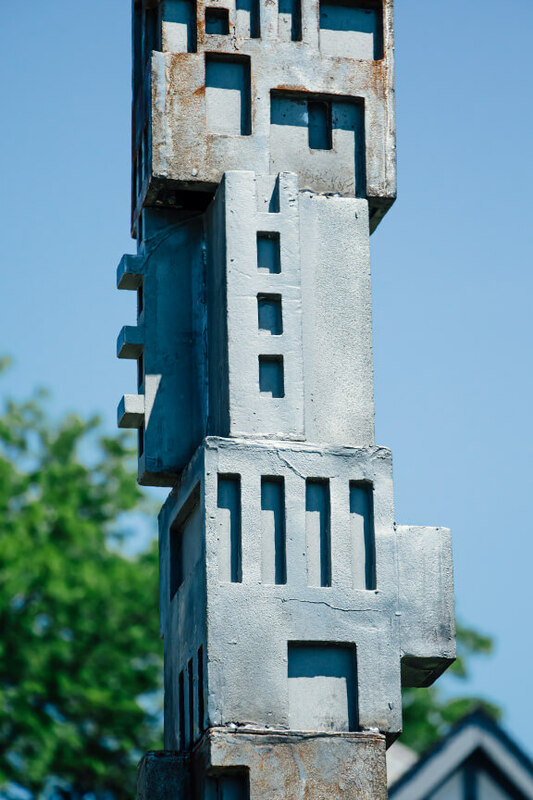 Marty Linson, Laumeier’s Chief Preparator, and Laura Mullen, Assistant Preparator, were instrumental in translating Scaria’s carved foamcore structure into a beautiful cast aluminum “totem” of urban life; their skills have helped bring Scaria’s vision to life. Thanks also to Erika Rogers, Collections Manager & Registrar, for her work in bringing Scaria and his work to St. Louis; Kelsey McGinnis, our Graduate Research Assistant from the Museum Studies Graduate Program at the University of Missouri-St. Louis (UMSL); and Dr. Maris Gillette, member of UMSL’s Des Lee Collaborative Vision, for her ongoing support of Kelsey’s work at Laumeier. Our behind-the-scenes staff includes Michelle Siegel, Development Officer; Melanie Baker, Membership & Museums Services Coordinator; Julia Norton, Administrative & Volunteer Coordinator; Rick Fouts, Controller; Lauren Kistner, Marketing & Communications Manager; Morgan Verble, Marketing Intern; Sara Matthew, Special Events Manager; Sarah Thomas, Special Events Coordinator; Elisabeth Murphy, Public Programs Manager; Karen Mullen, Curator of Education; Tara Morton, Recreation Facility Coordinator; Emma Roeder, Office Services Representative; Theresa Williams, Graphic Designer; and Joy Wright, Librarian. Thanks for all their work in bringing programs of excellence to our audiences. Scaria’s show is our second project in the new Adam Aronson Fine Arts Center, and I want to thank our staff for helping to animate this jewel of a “barn.” Thanks to Nick Lang, St. Louis County Parks Operations Supervisor, and his team including Yvette Luedde, Mike Clermont and Dave Miller, for their help in maintaining high standards for our work, as well as seasonal staff members Gary Hoegemeier and Frank Lauman. I also want to thank the leadership at St. Louis County Parks, our primary partner, for their support: Gary Bess, Parks Director; Tom Ott, Parks Assistant Director; Gerry Biedenstein, Special Projects Manager; and Kyra Kaltenbronn, Manager, Park Program Services, recently retired—we will miss your cheer and good humor. We welcome Kyra’s replacement, Jim Foley, to the Park. Finally, I want to thank Laumeier’s Board leadership for their dedication and hard work over the past six years in expanding our campus with the new Adam Aronson Fine Arts Center and the Kranzberg Education Lab. Nancy and Ken Kranzberg served as co-chairs for our Capital Campaign, and we are honored to have their long-time active leadership at the Park. I also thank the Aronson Family—Jonathan, Joshua and James—for fulfilling their mother Judy Aronson’s wish to name our new building after her husband, Adam, in honor of his role in co-founding the Park and in bringing generations of artists and donors to Laumeier. My thanks go to former Board Chair John Wuest, and Immediate Past Chair David Schlafly, for being partners in Laumeier’s growth. Scaria’s show will be open when we begin our year-long celebration of 40 years of artistic experimentation, scholarship and stewardship. I want to thank in-coming Board Chair Ramsey Maune and Vice Chair Alison Ferring for leading us into the next decade, supporting artists who are defining our visual landscape. I know they will help Laumeier—and St. Louis—to find new relevance in our global world. New Delhi-based artist Gigi Scaria’s practice focuses on remorseless transformation of cityscapes containing millions of lives, unremarkable and unrecorded, recasting their surrounding architectural drift as totemic forms. 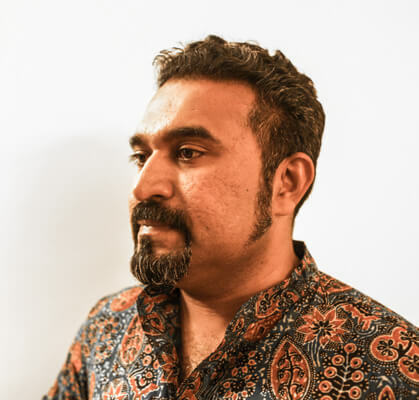 The sprawl of his home base of New Delhi and the chaotic demolition and displacement throughout impoverished precincts is of special interest. 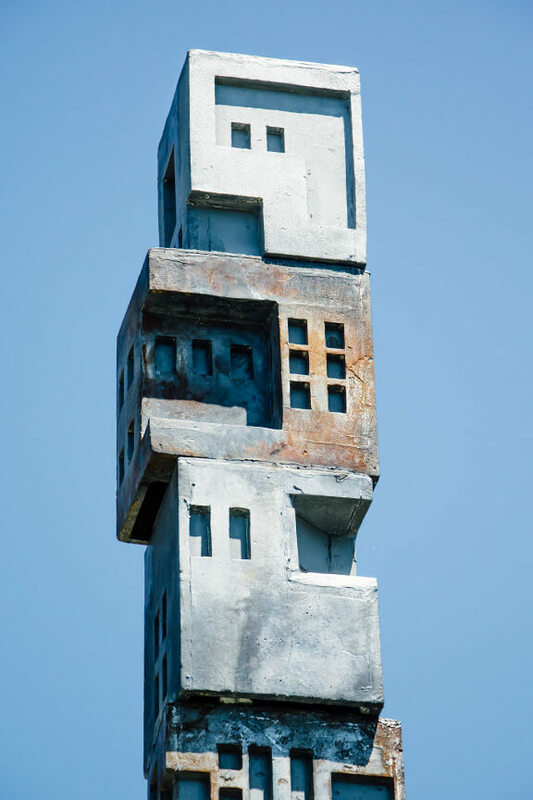 With a dose of satire and a splash of cynicism, his abstracted structures explore time as a changing material through which he analyzes urban architecture and investigates the unstable past, present and future of his location and the fragile impermanence of personal and social space. “Documenting the Indian city today is a tricky affair. They change at such a pace that even as you produce a document it is outdated. Every day there are reports of plans to replace the nearly new with the new and destroy arrangements that have served a diverse population.”2 Familiar with this cultural phenomena, Scaria’s work is also focused on “social mapping,” be it territorial, cultural or environmental, and of the hierarchies and systems of our global communities, a number of which he ties directly to his research about St. Louis, informing the development and selection of works for the exhibition Time. Scaria’s exhibition is the second installment of our New Territories: BRICS curatorial program, which focuses on working with artists from areas of the world experiencing rapid economic and industrial development.3 Scaria validates this growth through his observation of New Delhi and synthesizes a number of media for the exhibition, including a photographic triptych, two films, a large indoor sculpture and a new outdoor commission. 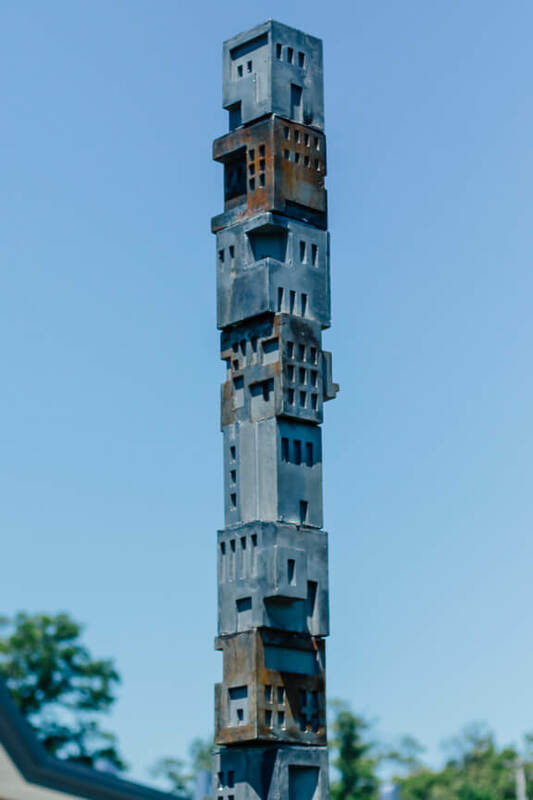 Each work also draws on totemic themes, continuing his inquiry regarding “time” and community collapse by cross-pollinating the disappearing architecture and symbols from New Delhi with Missouri’s regional history, using the formal organization of the Woodhenge at Cahokia Mounds State Historic Site. Inspired by a site visit to Cahokia two years ago, Scaria now creates two sculptural works that refer directly to the speculative theories about the collapse of the Mississippian civilization that was abandoned by the mid-13th century. Scaria surveys various icons of deindustrialized landscapes and the comparatively new Indian trend toward suburban sprawl. Laumeier’s location in Sunset Hills, adjacent to the quintessentially model American suburban strongholds of Kirkwood and Crestwood, brings to light the same “happening” in New Delhi.4 The physical erasure of the remnants of the pre-historic, archaeologically distinct community around Cahokia is comparable to the destruction of areas in New Delhi. Obsolescence meets the grinder of modernity. Industrial-scale developments uproot old communities with a long folk history, destroying the “unaesthetic” architecture associated with them. It is this action that becomes the subject and object in Scaria’s hands. “Resistance to the idea of an unknown part of the human psyche,” said Carl Jung,” the individual’s psyche is far from being safely synthesized; on the contrary, it threatens to fragment only too easily under the onslaught of unchecked emotions... We too can become dissociated and lose our identity.”5 If anything, New Delhi’s identity is that of a mortar and pestle grinding the inhabitants into a fine modern paste. The historian Lalit Batra laments, “By the time the age of liberalization dawned, even this attempt to deal with the problem was abandoned and was replaced by the concepts of legal and aesthetic criteria.”6 Erasure was placed at a premium as “slums that were illegal and certainly not beautiful could have no place in such a vision. And so began the policy of slum removal and relocation outside the city.” He estimates that between 1998 and 2010, an estimated 100,000 poor people were displaced in the city and relocated haphazardly. Both the indoor gallery works and outdoor sculpture in the exhibition are inspired by and built upon the similarities of and impetus for the migration shift and community collapse in both our locations, respectively. Woodhenge, 2016, is constructed using seven, ten-foot poles in a circular arrangement, mimicking the formal shape of the Woodhenge at Cahokia. The poles are made up of maquettes of disappearing Delhi domestic spaces, meticulously carved in wood and stacked on top of each other. Cahokia’s site manager, William Iseminger, writes in reference to Woodhenge: “There was symbolism to the circle, representing the cycles of life and the seasons. Indian peoples look at time as cyclical, whereas today we look at it from a more linear perspective. The circle also represents Earth, as seen in much of the Mississippian iconography, especially the circle and cross motif, with the cross representing the four cardinal directions, the four winds or four quarters of the earth.”7 Scaria’s version both vertically maps the reckless civic decisions and illustrates the beauty in simplistic urban domestic habitats. 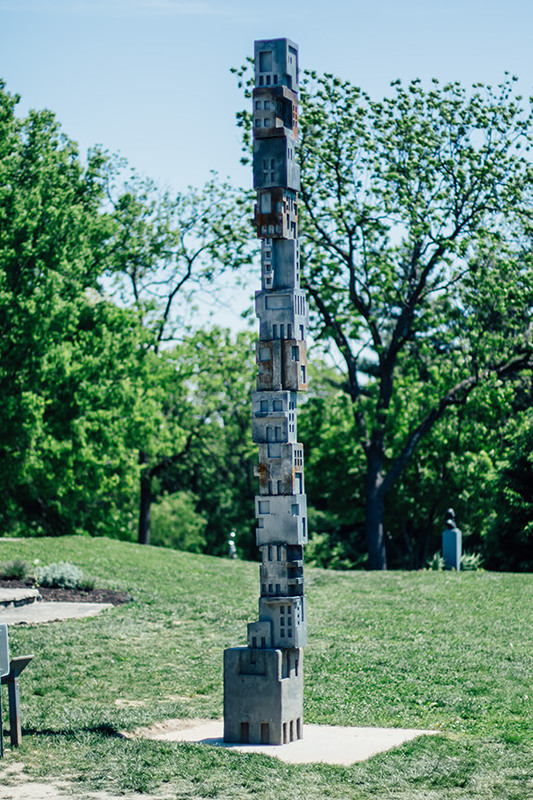 Extending this same conceptual framework outside into the landscape outside at Laumeier, Woodhenge, 2016, is a towering work using the same architectural motif to create a 16-foot stainless steel totem. For this work, Scaria chose to use a more permanent material to illustrate these ideas—but one that also contrasts with the unaesthetic understanding of these structures. 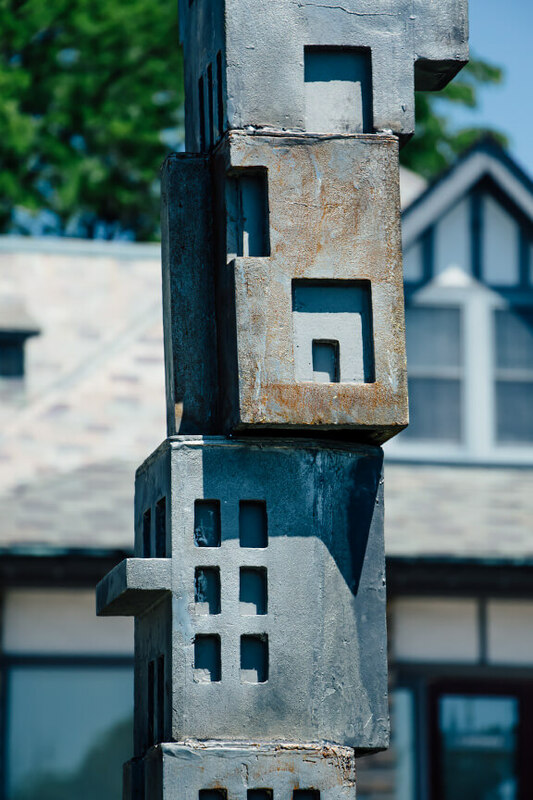 Both of these totemic sculptures stand as a monument to the building of a civilization past and as an illustration of historic and contemporary social and cultural shifts. Also included in Time are two recent films by Scaria that highlight the activity of habitation. Both use the movement that video provides to amplify the gestures of expansion and conquest. 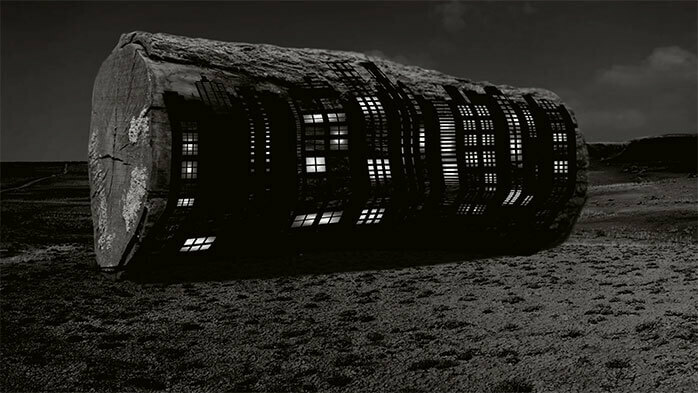 Shadow of the Ancestors, 2015, is set in a vast and deserted landscape focusing on a large decaying log. In time, the tree trunk casts a growing cityscape in its shadow. 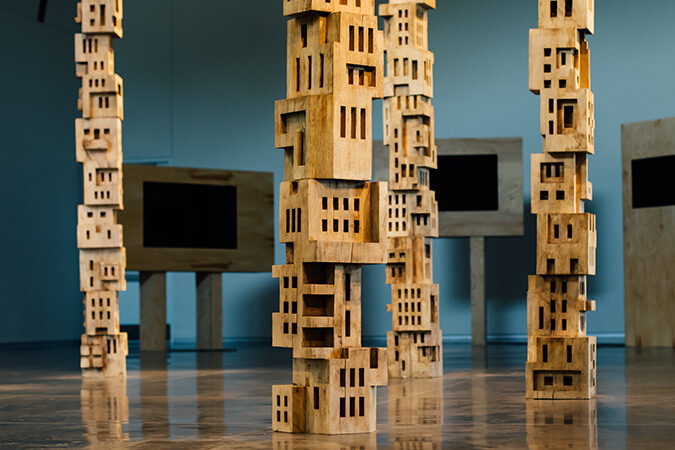 Eventually, the big stump rolls back and forth, catches its shadow of high-rise living and presents its imprint of a living landscape of identical apartment blocks. The work highlights Scaria’s preoccupation with mobility and human displacement at the expense of and disregard for the history and the manner in which it can dissipate landscapes at whim. 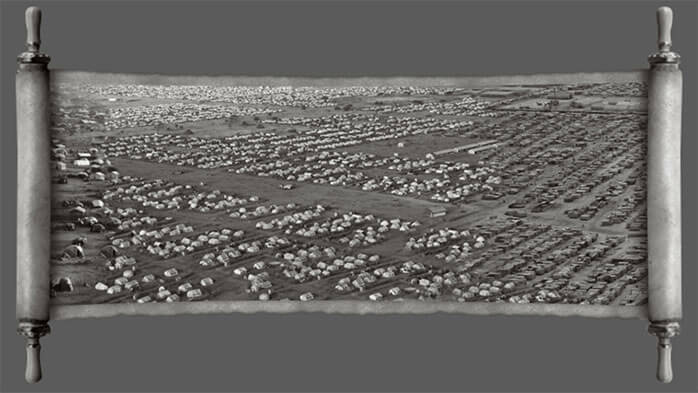 His video Expanded, 2015, uses the same architectural motif common in his other work; the film literally scrolls through an overbuilt landscape of temporary housing as it chronologically unfurls archival images of refugee camps from diverse locations and different times in our history. Stitched together in order to make it look like a single landscape, the scroll has both religious and historical connotations. The work deals with migration and what seems like an infinite stretch of the past and future of an unsettled human condition. Expanded also focuses on temporary structures, the design of habitat and the architecture of basic needs. The three photographs included in the exhibition document the artist’s mobile, monumental public sculptural work, each piece rolled into place to provide commentary on the context of its surroundings. In the sculpture Someone Left a Horse on the Shore, 2007, Scaria presents us with a mobile city in the shape of a Trojan horse. 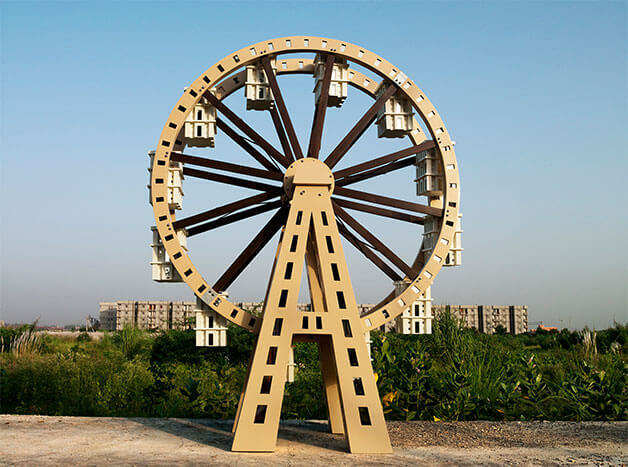 Wheel, 2009, was constructed to function as a Ferris wheel of cookie-cutter condos targeted for sale to the growing middle-class, a repetitive amusement ride that reminds us of a history lost in the ceaseless destruction for temporary modernity. 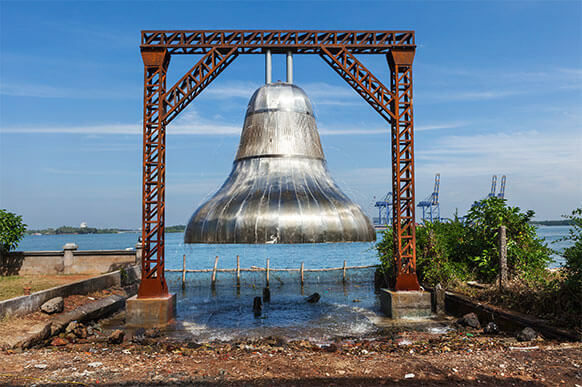 Chronicle of the Shores Foretold, 2014, is part of a photo series documenting the performance that is the fabrication and installation of a large-scale public work made for the Kochi Biennale in 2014 signifying the passage of time and experience of religion in the coastal region. 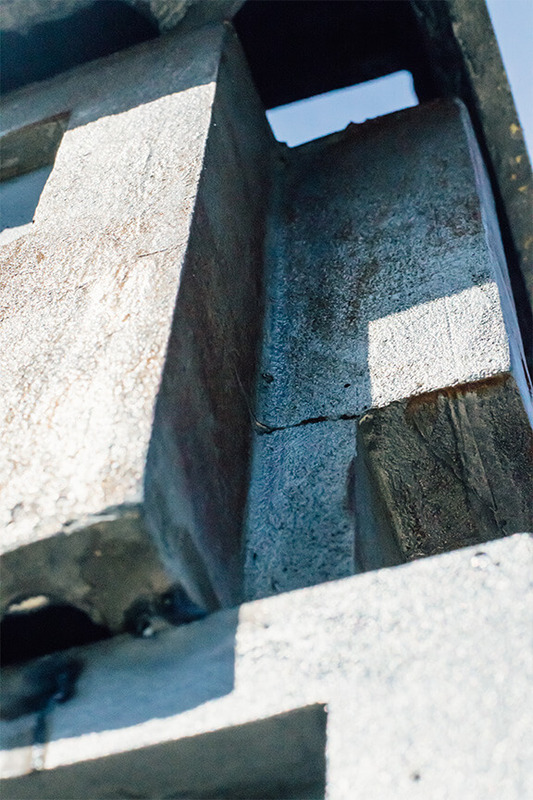 In the piece, a 2.5-ton stainless-steel bell stands 13 feet tall at the small dock. It functions as a fountain, with Arabian sea water spilling through its many drilled holes. The sculpture was lifted into place by a group of mappila khalasis 8, who are traditional dockyard workers. Their act, without their knowledge, was part of an orchestrated performance, an homage to the modern-day khalasis who continue to perform feats of lifting, now considered the domain of machines. Delivered with a sense of humor and deference using a variety of media, Scaria’s approach to the issues that both locations face is not a detached ironic smirk. The body of work in Time suggests that neither money nor machines really create, and that the getting and spending of everyday life diminishes our collective power. When referring to a distant past, as in the case of the Cahokia civilization, or an evolving present, as in the case of suburban St. Louis or New Delhi, indifference would be defeatist. This collection of artwork is a reminder that there are things left for us to say. For more than a decade now, Gigi Scaria has made works that perform quasi-archaeological operations upon the restless present. Scaria works in a variety of media—painting, photography, sculpture and video—hybridising historical narratives (such as the Trojan Horse and Noah’s Ark) with the endlessly inventive impulses of the developing world. His vision of the world is akin to a fairground that haunts the imagination of the modern through productions that oscillate between hypermodern flamboyance and the most utter abjection. The New Delhi that has been Gigi Scaria’s adoptive home for two decades (he migrated there from his native Kerala, some 2,500 kilometers to the south, in 1996) is one of the fastest-growing and most polluted metropolises in the world. Some 1,400 new cars arrive in the city’s bursting streets every day, and smog is perpetually at hazardous levels. Simultaneously, increasing areas of hinterland are converted from subsistence agriculture to residential high-rises for the burgeoning middle-class, even as the growth of shantytowns without even the most basic facilities engraves indelible scars on the urban sprawl. For Scaria, the collision of the hypermodern and the abject that characterizes New Delhi’s rapid growth provides an engine for trenchant commentary laced with a deep historical awareness. Scaria’s interest in quasi-archaeological delving brings to mind what Walter Benjamin wrote of the relentless accumulation of debris and destruction that characterizes the modern world. Inspired by Paul Klee’s Angelus Novus, 1920, Benjamin’s “angel of history” is caught up in an inexorable storm that “we call progress.” So, too, are the seemingly limitless swathes of refugee tents and “resettlement” camps that burgeon in the contemporary world, whether as a result of armed conflict or grandiose developmental agendas from national or corporate organizations that displace people “for the greater common good,” eradicating ways of life and ecosystems to make room for dams, power plants, export-oriented industries and so forth. Every transformation inevitably produces victims. With every seismic shift in geopolitical relations, with every dream of advancement and prosperity, comes a cost typically paid by those who benefit least from these shifts. The current Hindu nationalist regime in India has instituted slogans such as “Make in India,” “India Shining” and “Incredible India” to boost domestic industry, foreign investment, national pride and tourism dollars. Such conceits gloss over split and bleeding seams where the pluralistic, egalitarian and secular foundations of the Indian republic are violated, and attacks on rationalists, minorities and cultural practitioners continue to grow unchecked. Gigi Scaria’s last museum exhibition was titled Dust, 2012 (Ian Potter Museum of Art, University of Melbourne, Australia). Dust was, at first glance, focused on lived experience and weather phenomena in the parched environment of western India. On closer examination, Scaria proposed a thesis on the nature of faith and what might be involved in temporal realignments of faith-based propositions, in a time when such propositions are evermore attended by spectres of intolerance and radical revisionism. The desert landscapes invoked in Dust referenced both the physical experience of living in and moving through an extreme environment, and a deep cultural memory that embraced Judeo-Christian and Islamic mysticism where the parched land is the necessary foil for the thirsty soul. In his 2015 exhibition titled The Ark, 2015, Scaria turned to the Biblical legend of Noah’s Ark as a way of approaching the contemporary, where apocalyptic transformations seem a likely result of ongoing violence waged across geographic, climatic and spiritual domains. Time revisits some of Scaria’s earlier productions, and seeks to incorporate these into another sense of history, stretching from upheaval in pre-Christian times into the restive present. It may seem a curious flattening of diachronic awareness for an artist to seek a horizontal blending of such disparate contexts. However, it has remained important to Scaria that his work speaks to a diversity of lived experiences through an embrace of multiple references. Eschewing singular belonging and glib pronouncements, he chooses a complex layering that is generous and opportunistic in equal measure. The exhibition Time suggests that temporalities are different in different parts of the world, and that a finely nuanced calibration of time is an essential requirement for understanding a fractured world. Over 20 million people call New Delhi home. A city filled with individuals of various backgrounds, thoughts and opinions on challenges facing the city. This feed is a snapshot of the many voices engaging in a dialogue around the future of New Delhi. Far from the first, and certainly not the last word on this ever-changing and evolving conversation. Sorry, there was a problem loading Twitter data. Please try again later. Laumeier Sculpture Park, 501(c)3, partners with St. Louis County Parks in the development and preservation of this unique cultural institution. The website for Gigi Scaria: Time was designed and developed by Paradowski Creative, St. Louis. The website was typeset using MrsEaves and Katarine. Visit laumeier.org for more information about Laumeier Sculpture Park. 1. Ishmael Reed, From Totems to Hip-Hop: A Multicultural Anthology of Poetry across the Americas: 1900-2002 (New York: De Capo Press, 2002) pp.20. 2. Lalit Batra, “Out of Sight, Out of Mind: Slumdwellers in ‘World-Class’ Delhi”, Finding Delhi: Loss and Renewal in the Megacity, ed. Bharati Chaturved (New York: Penguin/Viking Books, 2010). Batra suggests that Delhi today is an ‘apartheid city’ that is the outcome of an exclusionary planning process. He points out that while the colonial government made no pretense of being inclusive, the post-Independence governments of a ‘free’ India seem to have abandoned all attempts at being inclusive.” http://infochangeindia.org/urban-india/cityscapes/new-delhi-apartheid-city.html, accessed 12/5/2015. 3. BRICS is an economic acronym for Brazil, Russia, India, China and South Africa describing an international banking system set up to rival the mature economies of the G7 nations. http://www.investopedia.com/terms/b/bric.asp accessed 11/23/15. 4. In 2015, Bloomberg Businessweek magazine named Crestwood in their list of “Best Places to Raise Kids in Missouri,” praising the nearby neighborhood for top-tier schools and excellent municipal services. http://www.stltoday.com/news/local/columns/deb-peterson/magazine-says-crestwood-is-the-best-place-to-raise-kids/article_cb937e9e-19f5-11e1-9fb7-001a4bcf6878.html accessed 12/10/15. 5. Carl Jung, Man and His Symbols (London: Aldus Books, 1964) pp. 11. 6. Batra, Out of Sight, Out of Mind: Slumdwellers in World-Class Delhi. 7. Bill Iseminger, Cahokia Mounds: America’s First City (Charleston, SC: The History Press, 2010) pp 134. 8. Khalasis refer to dock and port workers who release ships into the water. They are carriers of traditional ship building and maintenance techniques that were once used to launch Arab trading vessels that docked at Beypore, historically a nodal point for sea exchanges between Malabar and Arab regions.